The Superklean Duramix Model 8000GM-S is the most innovative steam and cold water mixing unit specifically designed to provide safe and efficient means of clean up by producing hot water instantly and economically with little or no maintenance. The DURAMIX 8000 unit operates under a wide range of steam and water pressures without changing internal components. In fact, it is one of the only steam and cold water mixing units in the industry with the ability to operate with as little as 30 PSI of water pressure. Its strategic dual output design, one at the bottom for a hose and nozzle and one at the top for hard pipe installation, provides the user with the ability to supply two individual terminals with their own hot water supply. For maximum efficiency, the second outlet can be used to feed a secondary source where hot water is needed after the primary outlet has been shut off. This feature drastically reduces energy producing costs, which is good for the bottom line, as the unit is capable of producing hot water for wash down as well as providing a secondary source of hot water for other uses 24 hours per day, 7 days per week. Our unique internal design does not allow live steam to penetrate. If water pressure fails, the Duramix 8000 will automatically close the steam poppet and not allow live steam to pass through our mixing unit, thus making this unit the safest in the market. 8000GM-S-T 300 series stainless steel, steam & cold water wall mounted mixer-hose station. 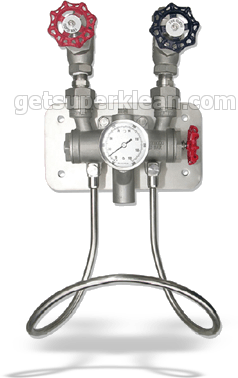 Includes globe valves, check valves, hose rack, mounting bracket, and adjustable angle temperature gauge. 8000GM-S 300 series stainless steel, steam & cold water wall mounted mixer-hose station. Includes globe valves, check valves, hose rack, and mounting bracket.